Greenville, SC – February 9, 2015 / Dark Corner Distillery today announced the availability of an extremely limited batch of its “rested gin”. 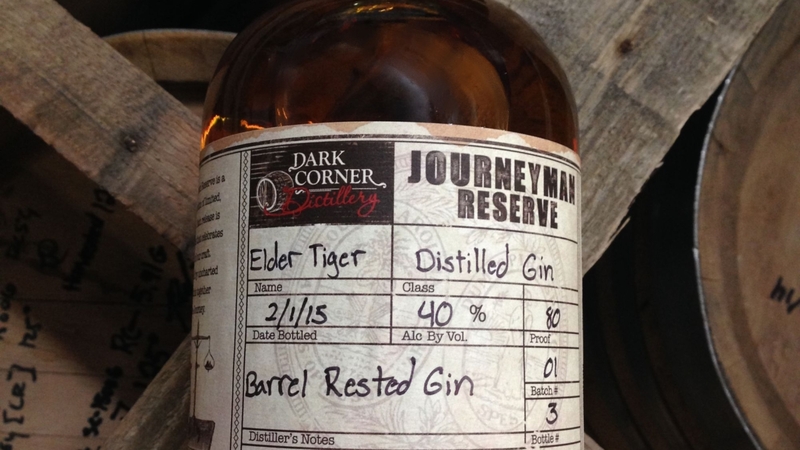 Only 40 bottles of the Journeyman Reserve Elder Tiger will be available. Barrel rested for 54 months, the Elder Tiger gin is 80 proof and comes in a distinctive 750ml bottle. The product will be sold at Dark Corner Distillery’s retail location – 241 North Main Street, Greenville, SC 29615- starting February 20th for $119.95. Doors will open at 11:00 AM. Founded in 2011, Dark Corner Distillery is a Greenville, SC based micro distillery most famous for producing the World’s Best Moonshine. Defined by heritage, the distillery offers visitors to the store on Greenville’s Main Street a unique experience, including product tastings and distillery tours. For more information go to www.darkcornerdistillery.com. Aroma: Mellow juniper core with floral & citrus notes balanced by new wood characteristics. citrus notes, balanced in harmony with hints of fresh cut pine. Mouth feel: Smooth and balanced.